There are few dessert salads out there. Some of them are variations on a fruit salad- some chopped fruits, a drizzle of sweetener, some mint. Other ones, scary ones, are made of marshmallows and bright green Jell-o and pretzels, and packed into a bundt mold. As my Vegan Mofo posts are salad-themed, I obviously had to come up with some kind of dessert salad. However, I wanted to break out of the traditional fruit / scary salad mold, and decided to try out sprouted buckwheat as the base, similar to my Cherry Buckwheat Breakfast Salad. 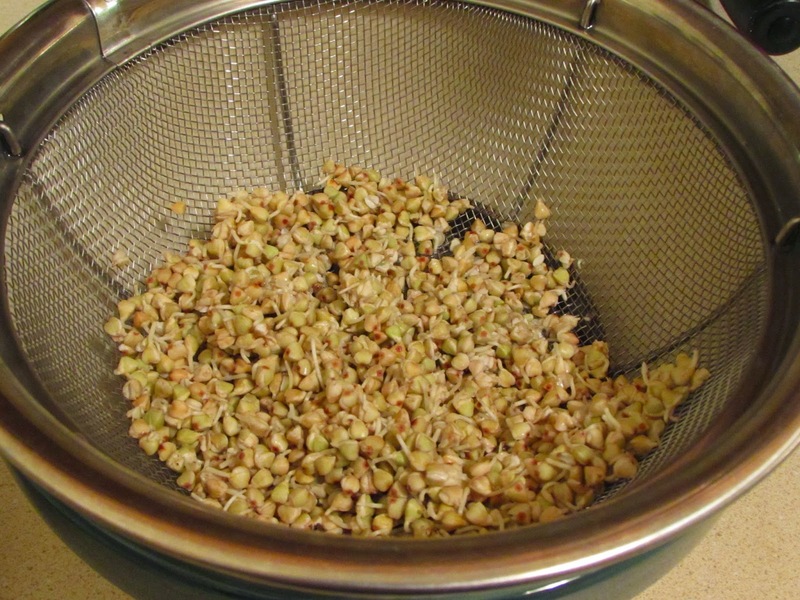 You can check out that post for instructions on how to sprout buckwheat. It is super simple- all it takes is water and time. Ah, the magic of creating life! The above photo was taken about 2 days into my sprouting session. These little babies are ready to munch on. You can tell when they are ready when all of the buckwheat pyramids have developed white tails a few centimeters long. 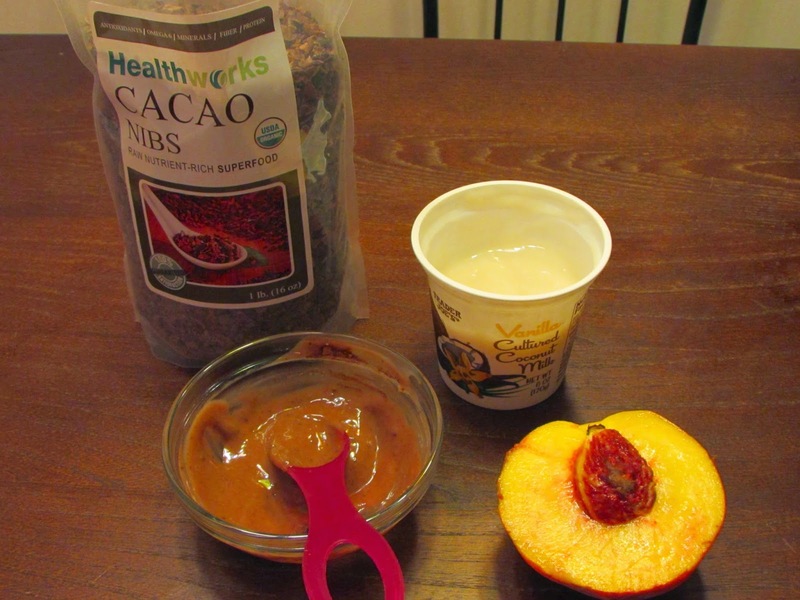 I created a chocolate coconut “yogurt” dressing from cocoa powder and Trader Joe’s Vanilla Cultured Coconut Milk. 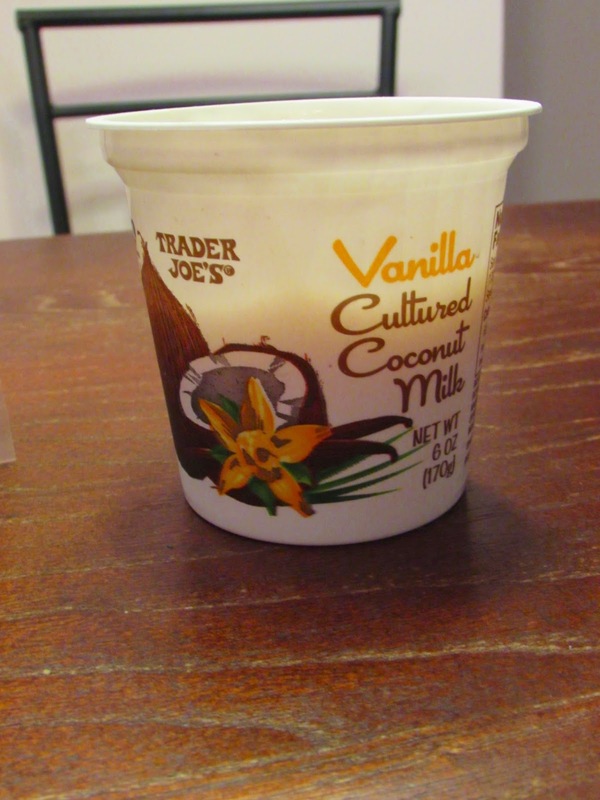 I am sure you can use your favorite non-dairy vanilla yogurt of choice if you do not have TJ’s access. My only gripe about coconut milk yogurt, and almond milk yogurt, for that matter, is that they tend to contain very low amounts of protein (1g for the container pictured), and very high amounts of sugar (usually over 20g). For this recipe, those attributes make it work well as a sweet dressing. I am not sure, however, that it would be a satiating breakfast in comparison to traditional yogurt unless paired with another protein source. 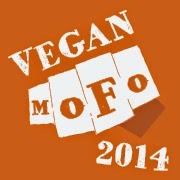 That being said, cultured coconut milk is a fantastic probiotic resource for vegans. Perhaps blending it with some vegan protein powder in a smoothie, or stirring some into a bowl of overnight oats would provide the best of both worlds. I am the type of person who always needs a lil’ something sweet after dinner. A sugar nightcap, if you will. 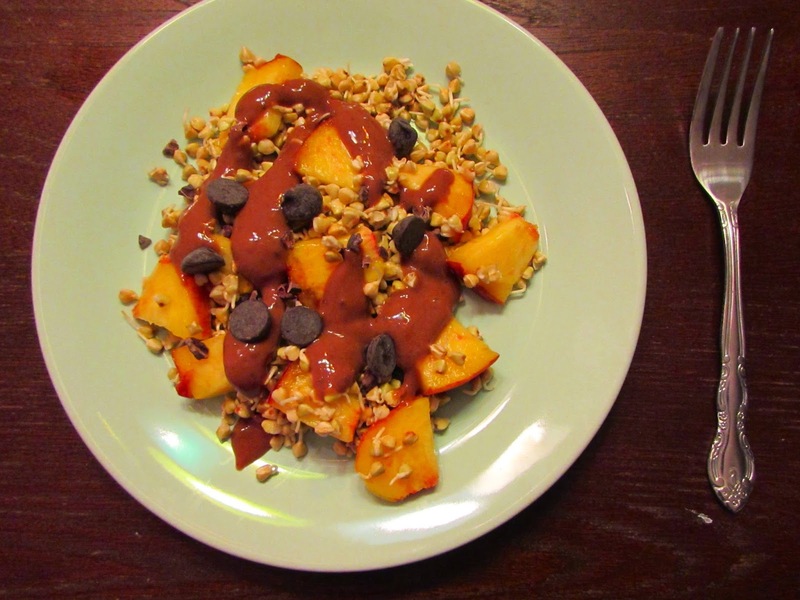 This salad does the trick: fruity and floral from the peach, complex and decadent from the chocolate dressing, with a bite from the chocolate chips and cacao nibs. 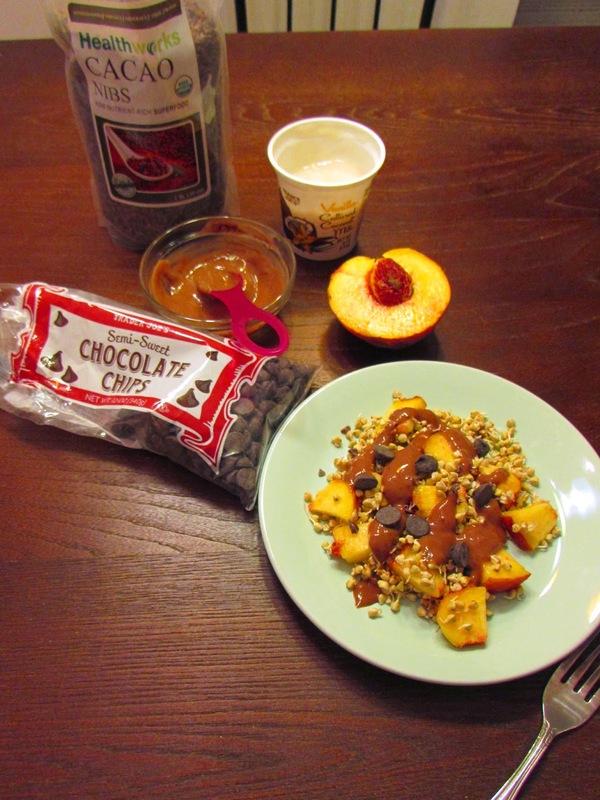 I hope this feel-good, healthful dessert makes your belly as happy as it did mine! Mix the first two ingredients together in a small bowl. This is the dressing. 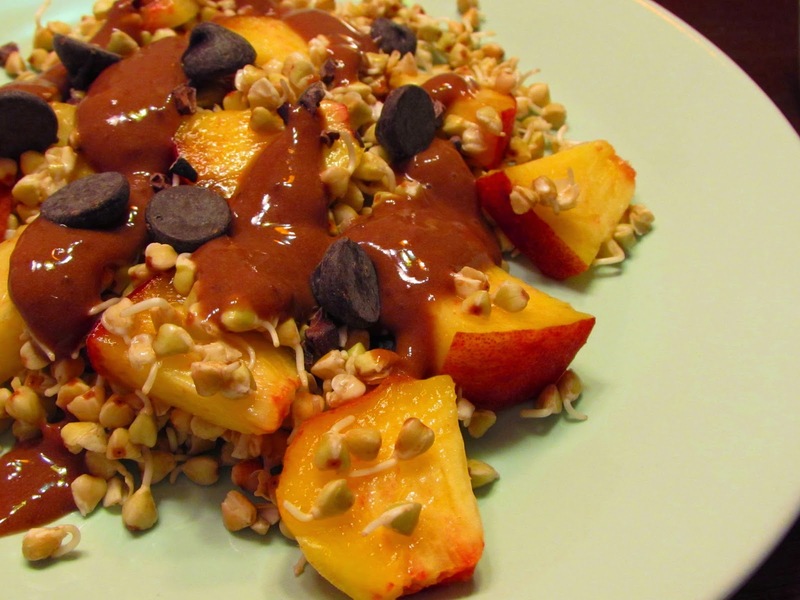 Arrange the buckwheat and peach on a small plate. Sprinkle on the chocolate chips and cacao nibs. Drizzle on the dressing and enjoy! You just blew my mind with a sweet buckwheat salad! Looks so yummy!